Train rides are my favorite. Quite possibly the train system is my favorite thing about Europe -- no invasive pat-down by TSA, no ear-popping, way fewer carbon emissions, no luggage restrictions, no passport control, and lots of exciting hustle-bustle of daily travelers. This morning began with a 3.5 hour train ride from Edinburgh to Manchester. I'd booked my ticket in advance to get a cheaper fare (you can save significantly if you are able to book in advance), as well as reserve a forward-facing window seat, which prevents puking (another hot tip that might only apply to me). In reviewing my options, I also ticked "Quiet Coach," which means a train car that restricts mobile phones and loud conversations. As I assumed screaming babies would also be forbidden, I opted for the "Quiet Coach." Unfortunately, three cackling Glasgwegian women did not appear to understand the term "Quiet," and I didn't want to be the mean old lady to tell them to hush. I suppose that's what iPods are for -- drowning out Glasgwegians. Lessons learned: definitely book in advance, but don't assume the Quiet Coach means anything. Getting mail is the best. It's especially good because the Royal Mail isn't exactly the most reliable service in the world (who knew how amazing the USPS is? I mean, you can trust that things will arrive ... and unopened, at that!). When one is expecting a package from home, one crosses ones fingers until said package arrives safely. I've gotten some pretty amazing packages since we moved (I've been working on a blog post about Tyra's over-the-top-awesome Christmas treats for months now), but this one hit the spot for both me and David. Its contents? America in a box. Processed, icky, treats that are oh-so-delightful. I'm pretty sure the bag of Reese's Peanut Butter Eggs won't last the day. A box of Manischewitz matzoh ball soup mix, for when we are sick, was a great surprise. I've yet to find matzoh meal anywhere. The most genius inclusion were various sizes of Ziploc™ bags filled with my dad's top-secret homemade popcorn recipe. I don't know what variety of seasonings he uses, but my dad makes the best oil-popped popcorn in the world. It's just an added bonus that it makes a perfectly recyclable (mmmmmmm!) packing material. Speaking of packing, I'm off to pack for a month-long tour, for which I leave TOMORROW! Yikes. Friday, March 2: Bangor, North Wales. Blue Sky Cafe. 6:30pm. Saturday, March 3: Walesby, UK. Candlelight Sessions at the Red Lion. Sunday, March 4: Norwich, England. The Bicycle Shop. Monday, March 5: London, England. House Concert. TBC. Thursday, March 8: Bath, England. Chapel Arts Centre. Friday, March 9: St. Austell, England. Eden Cafe. Saturday, March 10: Penryn, Cornwall, England. Miss Peapods Cafe. Monday, March 12: Glastonbury, England. The Hawthorns. Wednesday, March 14: Barnstaple, England. The Queen's Theatre Gallery. Friday, March 16: Kingswinford, England. Woodman Folk Club. Sunday, March 18: Rydal, NW, England. Nab Cottage. Tuesday, March 20: Edinburgh, Scotland. Leith Folk Club. Thursday, March 22: Kirkcaldy, Scotland. Acoustic Music Club, the Polish Club. 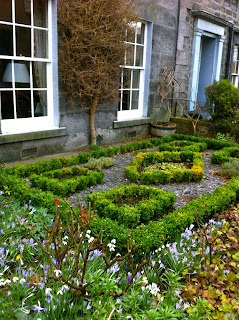 Friday, March 23: Aberdeenshire, Scotland (Aberdeenshire). Woodend Barn Arts Centre. Saturday, March 24: Gartly, Scotland (Aberdeenshire). The Tin Hut. Last week's Castle Collection improved my mood so much that I thought I'd make it a weekly appearance. I've got a lot of castles in my pocket, so it should keep us all entertained for a while. This blog becomes boring when I get all existential and dark. I'd rather think about castles. Last time, I gave you my first three castles, in order of appearance to me. The following gems are in no particular order because, well, I've seen a lot of castles by now. Don't get me wrong, they don't all blend together. I just lose track of time when my mind drifts to fairy-tale land. Caerphilly Castle, May 2010. Photo by Brigid Kaelin. To your right, we have: Caerphilly Castle, Town Centre of Caerphilly, Wales. I came across this gem quite by accident while playing a show one May evening (2010) outside of Newport, Wales. My tour partner, Butch, and I decided there was no point wasting daylight with a soundcheck. Instead, we hunted down a mighty fortress and went exploring. I love all castles, but this one one straight out of Dungeons and Dragons. (I think. I was never allowed to play because the neighborhood boys had a no-girls-allowed rule.) It's surrounded by a moat, and at least one of its towers is leaning dramatically. The grounds have wooden catapults and lots of Welsh people, who add many extra consonants to their language to confuse you. Interesting fact? Caerphilly is the 2nd largest castle in Britain (after Windsor Castle) and was the first truly concentric castle -- built in the 1200s. Also, we saw a wedding taking place inside the castle on this Saturday afternoon. Talk about romantic! Azaleas at Inveraray Castle, Scotland. Next up in my castle collection is Inveraray Castle in Scotland, which I first collected in May 2010. I've since been back at least twice, and to the castle grounds a few more times. Oddly, it's not exactly a castle you'll pass on your way to anywhere. It's only 110 miles away from Edinburgh, but the journey involves some wild and winding roads and takes about three hours. I happened to have played gigs in Inveraray twice and got to know the picturesque surroundings enough to return several times -- not to mention Inveraray has just about the best whisky shop in the world -- Loch Fyne Whiskies. 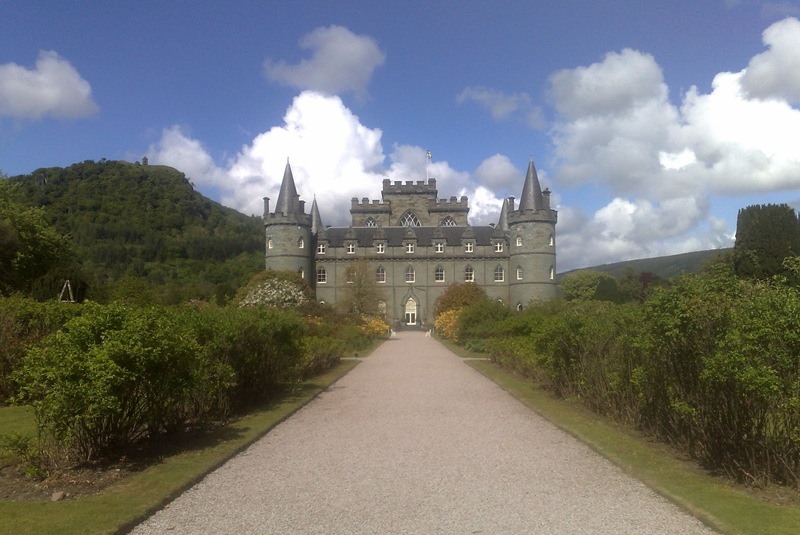 Inveraray Castle has those pointy turret things that show up in fairy tale illustrations, and the castle gardens are stunning in the spring. Also, people still live here! Can you imagine? The Duke of Argyll, his Duchess, and his children actually live here, despite the thousands of visitors who wander the public areas daily. That's enough for today ... but check back next week for more castle fun. I'm also starting to wonder where I'll be for Castle Day 2012! Guess who's co-hosting a radio show this weekend? That's right, it's me! Sure, I've been a guest on radio shows plenty of times, but this time I'm actually playing the role of co-host, or "glamorous assistant," as Jim Welsh, host of Music Routes on Leith FM, prefers. I've been narrowing down my list of tunes. It's an Americana/Folk Music-heavy programme, which is making it hard for me not to just play all of my favorite artists. I mean, I guess it's not unlike making an awesome mix tape for, um, the vicinity of Edinburgh. Still, I'm trying not to play my friends' music. Maybe just a few of them ... but that's only because I happen to know a lot of great musicians. Besides, I don't think Elvis* will mind. You can listen to the show online at www.leithfm.com on Sunday between 2:00p-4:00p GMT. That's 9am-11:00a, Eastern time. Something cool to watch (if you like that sort of thing). UK Tour Dates in March, plus Glasgow tonight. By the way, the "show" I'm playing is because I'm a musician. Did you know that? I was up last night thinking about how I've sold a couple thousand copies of each of my albums -- a feat I'm very happy with -- but that from my site statistics, I can tell that a lot more people read my blog than own my albums. Maybe I'm in the wrong career and should write a book instead of making a new record. I have no complaints at all; I've just been doing lots of thinking lately. But because I love performing music, I'm heading out on the road next week with a lovely English songwriter, Kirsty McGee. Kirsty is currently hard at work on a new album and has a PledgeMusic campaign to pay for it, if you'd care to pre-order the new project. If you'd like to hear her live first, come see us at one of the many shows we're playing. Also, if you're driving a long distance to hear me (Aneil! ), you should know that, while I'll definitely be performing some of my tunes, Kirsty is headlining these shows. Some of the gigs may have different formats, so shoot me an email (brigidkaelin at yahoo dot com) if you'd like details about a particular one, and I'll try to find out more info for you. Friday, March 23: Burn O'Bennie, Scotland (Aberdeenshire). Woodend Barn Arts Centre. Princess follow-up, colds, and pretty gardens. First, David did indeed meet HRH Princess Royal (Princess Anne) yesterday, which means when he calls me "princess," I no longer know who he's thinking about. One thing I don't understand about modern-day royalty is why they don't where crowns and tiaras. Princess Anne looks like a beautiful finely-dressed wealthy British woman, but a little sparkly on her head would go a long way (at least with little girls like me). Then again, maybe that's why things with me and Prince William never worked out; he knew I would wear a diamond tiara to the Waitrose. Kate would never stoop so low. Second, does anyone know a good natural remedy for a cold? I thought my immune system was iron. We had a sick houseguest a couple of weeks ago, but did I catch any of those germy-germs? Nope. David caught it, but I've even staved off his coughing and sneezing about the house -- until two days ago. My turn. So what works? I know about coneflowers (echinacchea) and hot toddies. If anyone's sitting on an old medicine man's secret, please share. Tussin isn't helping. I'm pretty sure it's just a regular old cold. I haven't posted photos in a while, so let's catch up. My parents brought chocolate chips (as a gift, you customs trolls!) with them. Finally. 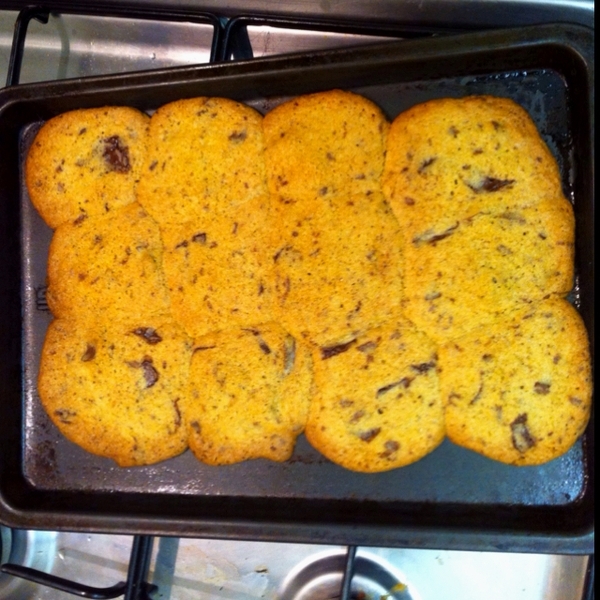 Cookies that taste like cookies. The first batch is gone because David and I have no self-control when it comes to cookies. 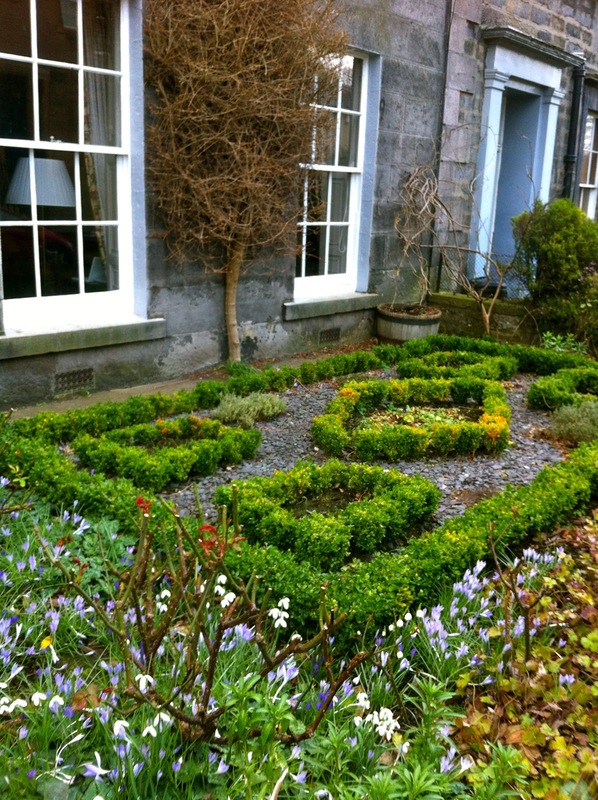 Crocuses and front garden. Edinburgh, Scotland. Finally, so David's family gets to see what he's been up to: he's been cooking dinner. Lucky me! Sometimes I have trouble remembering which stories are dreams and which are real. This could either be a symptom of neurosis or of living a really awesome life. While David was getting ready for school this morning (and while I wiggled around in bed and made stuttered conversation trying to prove that I was awake), I noticed he was putting on a suit. Yes, it's an MBA Programme, but he doesn't wear a suit to school most days. I mumbled, "Do you have a job interview?" He usually ignores my morning questions because I usually fall back asleep before he has time to answer. This time, I'm pretty sure he said, "No, the Princess is coming today." Now I'm awake and pondering whether that conversation actually happened. I mean, it's possible. They have royals and stuff here. I'll report back after gathering evidence. My Castle Collection, part one. I'm trying hard to get obsessed with Pinterest, but I'm not there yet. Still, it does seem like a fun way to keep track of one of my favorite collections: castles. Some people collect little dessert spoons, snowglobes, or Spode Christmas dishes. I collect passport stamps, freckles, and castles. Like anything one loves, it's best to let them live on in their natural habitat. Thus, I will not be buying up properties. I would, however, like to keep my collection in a proper place: enter Pinterest. Today we visit my first three castles -- not counting that weird one in Versailles (ver-SAY-uhls), Kentucky. My first castle ever was the Tower of London, first visited in March 1998. I had a personal tour guide in the form of my college roommate's dad, Steve. He shared my love of history -- emphasis on the story part of the word -- and adventure, and we both oohed and ahhed when we stood on the place where Anne Boleyn was beheaded. Pretty amazing first castle, if I do say so. I'm still hunting for these photos (they are pre-digital!! ), so browse the UNESCO galleries for images. My second castle? 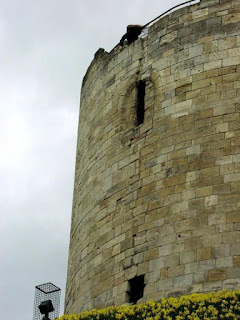 Clifford's Tower, York, England. March 1998. It's the opposite of the Tower of London. Wee and ruined, Clifford's Tower is more of an old lookout point than the castle of your childhood dreams. On this particular occasion it looked down on me from a hill yellow from daffodils. I climbed to the top, bought souvenir juggle balls, and pretended to be Rapunzel while gazing upon the Old City Walls. Third castle, same trip: Edinburgh Castle. Since March 1998, I've visited Edinburgh Castle six times -- two of them in the past week. It's my favorite, and not just because it's the fortress protecting my current city. It's everything you want a castle to be. It sits atop an extinct volcano, jutting out of the rocks like something straight out of a fantasy novel, high above the city of Edinburgh. Even after you enter the portcullis gates, you wind around narrow and steep cobblestone paths to reach the Royal Quarters, passing several other buildings that date back to the 11th century. On top of the vibe and the view, you also get to see the Scottish Crown Jewels. I'm also pretty sure I've taken the guided tour so many times that I'm licensed to give my own tours. Let me know if you're coming to town, but make sure you're prepared to hear oodles of factoids. Now that I've spent several hours this morning doing business, emails, taxes, and writing, I think I'll spend some time posting these photos on Pinterest. I'm trying hard to develop this hobby: direct link to my Pinterest Castle Board. Moving abroad? Some things you might want to take with you. I was at a Superbowl party whenever the Superbowl was, and some fellow expats got to talking about the typical American things you can't really get over here. Sure, Amazon delivers, and the big superstores can order many things for you. But it's not as easy as you'd think to find those little things you take for granted over here, and who wants to go to the 'burbs to a superstore when you live by a castle? Talk about a buzzkill. My life doesn't revolve around ranch dressing, but I'm pretty sure that's because I'm not from Texas. When my parents visited a few weeks ago, they brought little packets of ranch dressing mix for David. He is a Texan, after all, and pub chips and pizza crusts are apparently lacking slightly without ranch. (If he ever actually brings his own ranch to the pub, I'll let you know.) You can't get it over here, and David's a much happier man now that our pantry is stocked with that weird processed powdered stuff you mix with mayonnaise and milk. This is something I miss ... madly. So far the only real-ish tortilla chips we've found over here are: Doritos™. Waitrose makes a wee pack of tortilla chips, but they don't taste like home. Unfortunately, tortilla chips don't pack well, but they make fabulous (and edible, if you like crumbs) packing material. 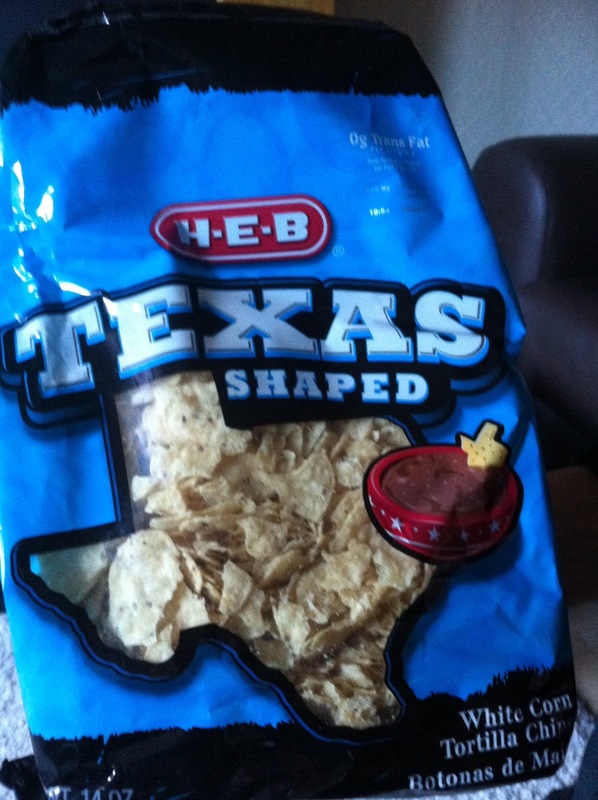 See the Texas-shaped chips shipped from Austin to us by lovely friends. We found about three that were still shaped like the state. The rest looked more like Hawaii. Another expat brought this up. I actually can't stand microwave popcorn because it tastes like chemicals to me. I'm told that the microwave popcorn over here is even worse. 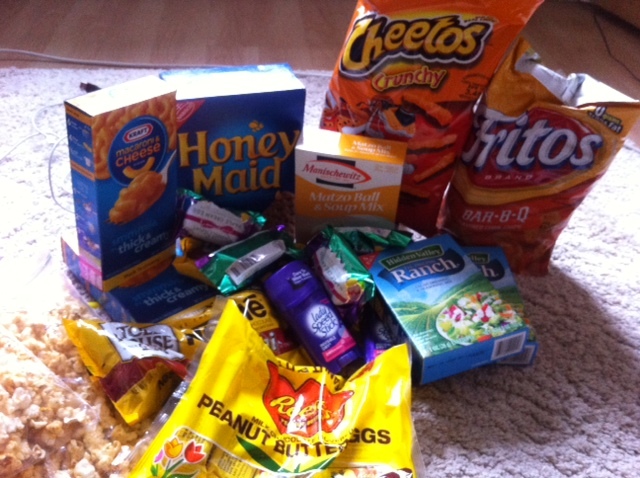 One fun expat said when she went to the US for a visit, she was bringing an empty suitcase to fill up with ranch dressing and microwave popcorn. Team USA! Some folks here claim they have found the elusive chocolate chips, but I had to import them from my parents. I've been to countless grocery stores and haven't seen these little kisses of chocolate deliciousness. Even semi-sweet chocolate is hard to find, so my cookies have had to suffer with Cadbury dark chocolate chunks. This is not actually a problem. I never even tasted this stuff until college. I think it's gross -- unless I'm recovering from a migraine. After a day or writhing, sweating, and crying in bed, the only thing I want is a fountain Coke and a box of macaroni and cheese. Oddly, David has the same craving after he has a migraine (it's love!). 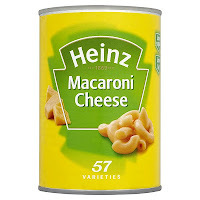 Here they seem big on Heinz canned mac'n'cheese, which I am not brave enough to buy. I hadn't noticed they aren't readily available here until the Superbowl Party Goers brought it up. Further investigation proves them right. It's time to find a recipe. My parents re-filled David's "Old Spice" prescription when they came, but I figured I could find something. I hate gel deodorants, so it looks like I'll be trying one of those bizarro natural rock salt brands that don't quite work as well as the carcinogenic US brands. I'll report back when it's time, but I'm longing for some of that purple Lady's Speed Stick. There is plenty of peanut butter over here. It might not be Jif or Skippy or any other of your childhood brands, but all those jars taste peanut-y enough to me. Plus, the earthy food stores have natural fresh peanut butter. Also, no one puts it with jelly over here. But it does exist, even at the smaller stores. Truthfully, there's nothing on this list I can't live without, but it's been funny to see the cultural differences between the UK and America. 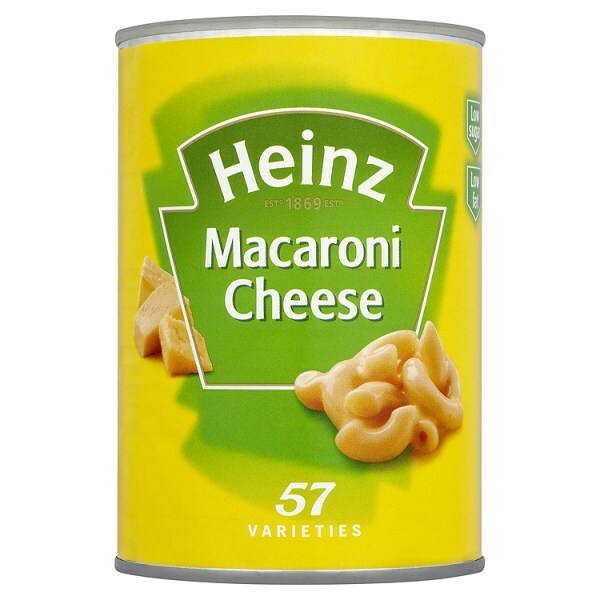 Don't get me wrong, the UK has plenty of processed foods of its own, but I'm not quite willing to try anything else in a box. Thank goodness for the Sunday farmers' market. External validation in a long dark winter. Last night's show was ... sold out! How about that for a little validation, eh? I hate that that sort of thing makes me feel good, but I can't help that it does. This business is hard. You create and you put yourself out there for everyone to judge. Even when years of training and practice makes the performances come easy, there is still nothing like the will-anyone-show-up-tonight? jitters. I get them every show, even when I suspect it'll be a good one. But yesterday afternoon, I was frantically texting folks who'd planned on coming that there were no more tickets available. Again, it felt good. This winter was so dark, I'd forgotten that performing is just about my favorite thing in the world. There is nothing like seeing an audience laugh, smile, and forget about their troubles for a while. I wish I could connect with people on that level in everything I do. Or maybe I just need to perform more. Any booking agents feel like booking me a run of folk clubs this summer? I'm so tired of google, email, repeat. I need more verse, chorus, bridge. Just another Tuesday: Why I don't love Valentine's Day. Ah, Valentine's, you day of Saints, Massacres, and Fertility, I never really celebrated you. I adore love, so let's not mistake my attitude for jaded misanthropy. I just can't stand the pressure, for the same reason I'm not big on exchanging Christmas gifts. I'm a big fan of a candlelight dinner on, say, any old Tuesday, not just one day in February. And presents are better surprises on, say, Friday mornings. Why the pressure? David and I had only been dating a few weeks when Valentine's Day was upon us. Though we'd been pretty much inseparable since our first date, we were both a little hesitant when February approached. To make myself even more clear that I didn't want to do anything for the holiday, I organized a big EP release show that night. Anyone who knows me knows that I'm all business on the day of a show, so any secret Valentine's plans would have been foiled by my attitude. I'm pretty sure we both sighed a huge sigh of relief the next morning. He had proof that I wasn't being all crazy "I don't want flowers/WHY DIDN'T YOU GET ME FLOWERS???" and I had amazing proof that he was able to let me be on stage with several other men, in a packed room, on a holiday meant for couples. As always, David was perfect. Today, he even let me eat the last Samoa. If you see him tonight at my gig (yes, I'm working again on Valentine's Day), don't pity him. We celebrate daily. But if you can't stand the sight of him at the table by his lonesome, you could always send him a drink. Missing Louisville friends, but a good Edinburgh gig Tuesday! One of the things I miss most about Louisville: my musician friends. I miss playing a show and inviting Steve Cooley to play, knowing he doesn't need a minute of rehearsal, and I can still throw any song in the world at him -- even one I've just made up. I haven't had that sort of camaraderie in the local scene here in Edinburgh, at least not yet. Tomorrow's gig at the Leith Folk Club has me in a brighter mood, however. Suddenly, I've got three local friends who are also playing, and it's looking more and more like a "Brigid and Friends" night should look. You know, the kind of night where I don't get any sort of break, and I love it. Opening the show (or "playing a support set," as they say over here) is Adam Holmes. I've been playing accordion in his band for a few months now, and he's a real talent. He'll start the show at 8:00 with a half-hour of his own tunes, and I'm sure I'll be joining him. Then during my sets (I'm playing two), Diana de Cabarrus of CandyThief will be joining me on guitar. That's right, a woman guitar player, and she's not only incredibly talented at her instrument, but also a great singer. So here's hoping I can talk her into playing a few tunes of her own. Then to really take the night from great to a-night-you-won't-want-to-miss, the one and only Nick Keir is stopping by to sing a few tunes with me (and I with him!). He's the whole reason I started touring over here in the first place, and there aren't enough superlatives to describe Nick and his musical accolades. He's an Edinburgh treasure, and somehow manages to bridge the gap between traditional Scottish folk music and modern Americana. Do I sound like a press kit? Sorry, I'm a fan. Getting together a setlist now, so I can concentrate on enjoying a night of "Brigid and Scottish Friends" (well, Diana's English, but she's still a friend). If you don't have Valentine's plans, and you want to keep David company (his silly wife is working that night), join us at the Victoria Park House Hotel, 221 Ferry Road, EH6 4NN. Doors are at 7:30, show at 8:00. It's £6, I do believe. There's also a bar and good food available. Seating is limited to 50, so you might want to reserve: leithfolkclub@hotmail.co.uk or phone:- 07502024852. We got this awesome two-bedroom flat, and nobody came to visit us until December. Come April, we'll be downsizing, so you missed your chance, folks! Still, February has been loaded with friends from home, and it's been really fun. We're currently on our third guest this month, with four and five arriving on Monday evening, and it's not even the Ides of February. Fun times. Yesterday, Claire and I went to the Castle. If your city has a castle and you don't appreciate its might and awesomeness, then you need to break into the jaded façade you've grown. Castles are fantabulous, and I never get sick of seeing Edinburgh Castle. It sits upon a mighty volcano (how a pre-geology world could tell that this particular volcano was extinct is a feat as mysterious to me as how they placed the first cornerstone on a precarious cliff made of petrified lava), and overlooks Edinburgh from all angles. I first visited it in 1998, and again in 2002, and 2008. It took me until January to return, at which point we purchased a year-long membership (for the price of about two visits). With all these visitors, I figured we'd be making a few treks up that volcano and into the chambers of Mary, Queen of Scots. Claire has been a super-fun and super-tolerant visitor, and she's listened to my history-nerd ramblings and non-stop spouting of interesting facts without complaint. In fact, she actually seems to enjoy them, although she was a theater major, so it's hard to tell. Oh, if you're reading this in Scotland, maybe you'd like to come to my Valentine's Day gig? It'll be a couple of sets with friends at the Leith Folk Club (the Victoria Park House Hotel 221 Ferry Road Edinburgh, Lothian EH6 4NN) starting at 8:00. I'll be playing mostly original stuff, with a few fun covers thrown in there, I think. I've also got a whole UK Tour to announce next week, covering many cities I've never played before. I'm back! The castle photo above is courtesy of the Edinburgh Castle website. Singing the standards in my living room. It's a cloudy day in Edinburgh, the first in a while. You don't believe me because the Scots have done a fabulous job of keeping out tourists by telling folks it's always dark and rainy here (it's not). But today feels like, well, like Scotland. Days like this make me hyper-contemplative. I'm in a second-guessing, journal-writing, ballad-singing type of mood. For the first time in months, I've pulled my keyboard out of its hiding place and given it a little love. I've got a great gig on Valentine's Day, but this morning I've been playing Gershwin and Cole Porter love songs -- the perfect soundtrack to a cloudy February day. Tonight I'm heading to a rehearsal with the cabaret band I occasionally sing with. We don't have any gigs booked yet, which makes me wonder why we are rehearsing ... but I'm looking forward to singing some old-timey tunes. Today, however, I wish they were more ballad and less dance. But I suppose rehearsals can't be chameleons. I've learned to be a great budget traveler through necessity, despite my single malt (which I like better than champagne) taste. As the dollar remains weak, budget traveling becomes a more and more important skill. I don't intend to stop traveling; I only intend to travel smarter. 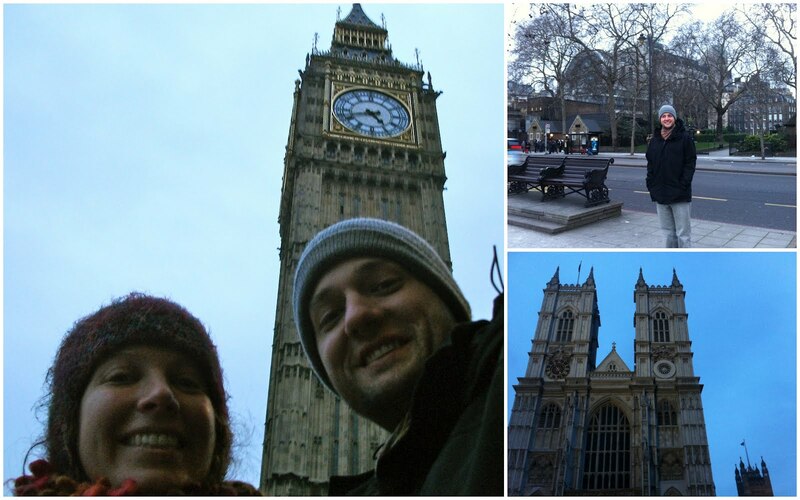 Last week's trip to London was an exercise in just that. London is the 18th-most expensive city in the world, the highest being somewhere in Angola, if you can believe that. * The highest-ranked US city (New York City) comes in at a mere 32, and if you've ever been to NYC, you'll probably be in shock thinking of a city that's even more expensive. I mean a one-way ride on the London Underground in City Centre now costs £4.00 -- that's about $6.50. That would buy you several bagels and cream cheese in NYC, not to mention that a Subway ride to anywhere in all five boroughs currently costs $2.25. I don't think anything in London costs $2.25. Of course, it helped that we were crashing in a hotel room with some friends (who got the hotel room on credit card points), meaning that we spent nothing on accommodation. If we'd had to pay for accommodation, we wouldn't have gone. We are living on a student budget, so even a hostel in London would have been luxurious. The Natural History Museum is free these days. We managed to sidestep the crowds by using the side entrance and headed directly for the stuffed Dodo Bird. At least one of the two stuffed Dodos (maybe both, I can't remember), came from some rich dead man's private collection in the late 1600s. The Museum eventually bought the good stuff from him/his estate, and now anyone can run in and see a Dodo Bird. They are much cuter and even more whimsical than I expected. After paying our respects to El Dodo, we dodged strollers and wandering toddlers and headed for the lifesize replica of a Blue Whale, surrounded by lifesize models of many other animals. This whale made the elephants look like puppies. After the Dodo, we stumbled upon a few Ichthyosaur fossils that were discovered by Mary Anning, who I'd thought was a fictional character invented by Tracy Chevalier until I got about halfway through the novel, Remarkable Creatures, I read last week. That was pretty cool find, though not as cool as finding the Ichthyosaur on a beach would have been. We could have spent hours wandering around the museum, but we opted to head back into the sunshine. Our next stop? Harrods, just a short walk up the road. You might be wondering why a budget traveler who hates shopping would choose to go to a massive department store (over one million square feet!). These kinds of stores are great when you aren't actually looking to buy anything. I mean, Harrods sells Bösendorfer pianos! Being the food-obsessed people we are, however, we spent our time in the Harrods Food Hall, a scrumptiously-designed paradise -- Willy Wonka for adults -- that left us both drooling in wonder. We walked away with a lunchtime snack purchase of dates and cashews, totally about £5. -Share an entree when you dine out. You can't take home leftovers anyway, and it's much cheaper. -Go to the grocery store for snacks/lunch/beer. -Don't drink too much (easier said than done, but I managed not to drink at all this weekend and still had a blast). *According to this website which looks fairly accurate, but which I did not research too deeply. You are not getting enough potassium. I discovered a few weeks ago that apparently I cannot eat whisky and tatties with abandon without it sticking to my posterior. Since then, I've been keeping track of what I eat (and drink) with a fancy iPhone app. Don't worry, it's set to "maintain current weight" rather than lose weight because, well, I still like chocolate and cocktails (and my pants still mostly fit). Truthfully, I've gone well-over my caloric intake every day, but that is mostly because of my newfound obsession to get a completely balanced nutrient intake. You see, the app I'm using tells me how much of my RDA I've gotten for every vitamin and nutrient. This brings me to today's PSA: You are potassium-deficient. A person of my height and weight should get around 3500mg of Potassium a day, according to various books, websites, and the NHS (I've seen some American sites suggesting lower amounts, such as 2000mg. Even if that's correct, it's still a hard-to-maintain amount.) Now I don't know if you've ever kept track of your potassium intake, but I am betting you don't get near to that. -Eat 100grams of dried apricots for about %50 of your potassium RDA. Do you know what would happen to me if I ate that many dried apricots? The last time I did that I was in college and had to miss class because I was still on the toilet. I get tons of fiber, but 10 apricots is my limit. And that's only if I'm home alone for a few hours. -A sweet potato (including the skin) has just about the highest potassium of any food out there, but even one average sweet potato has just 500-600mg. Seven sweet potatoes is what it would take, my friends. Seven! I suppose I could give up on all other nutrient goals, and focus entirely on potassium. How about this for a daily menu? Well, now that I typed that out, it doesn't seem as hard to get. But it also doesn't seem like a menu I'm likely to eat every day. Maybe that's because I can't get good cantaloupe or avocado in Scotland. Anyway, I suppose if I forgo all whisky and girl scout cookies, I could get enough potassium and stay within my recommended caloric intake. But where's the joy in that? 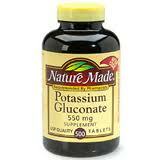 If I've now got you worried about your own potassium intake, I'm sorry. I don't mean to preach fear. I've been obsessively researching this for weeks now, and there are loads of websites on the subject. Here's one that gives you serving sizes and potassium-rich foods, just in case you become neurotic about your RDA like I have. I actually told my doctor about my potassium concerns last week at my check-up, and she kind of rolled her eyes and told me she's sure I get more potassium than most because of my vegetarian diet and not to worry. But, but, but!!! London, snow, airports, and dodo birds. I thought Louisvillians were bad about snow-pocalypse panics, but at least we usually get 6-12" in a proper snowstorm. 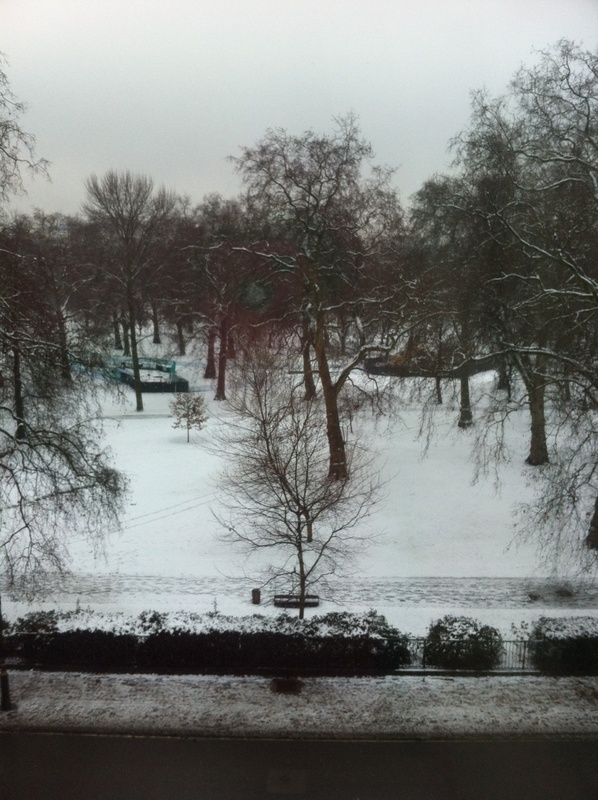 London came to a halt with a mere dusting. To be fair, snow's unusual for them (unlike Louisvillians, who should be used to it by now), and by morning there was about an inch of accumulation of good, proper, snowball-making snow. The streets, however, were clear and safe. The sidewalks were a bit treacherous -- as it goes in a community a much less litigious than America. I happen to like the whole, just be careful and if you fall, it's your own fault attitude. But maybe that's just because I hate shoveling my own sidewalk. We would never had bothered flying to London from Edinburgh before (with airport travel time, it actually takes slightly longer than the train, door-to-door), but some amazing friends had British Airways miles to spare. Also, surprisingly, even without miles, the plane is sometimes cheaper. Also, it was fun popping on a plane and an hour later touching down in London. And browsing duty-free is more fun than sitting on a train for four hours. Still, I forgot how much I despise Heathrow. Usually I can't stand them because of their harsh immigration officers -- drilling and drilling obvious tourists and being just plain mean at times (hey, it's like being asked for a hall pass when you're obviously going to the library!). This time, however, I remembered that Heathrow is also horrible when it comes to inclement weather. On Saturday evening, the airport canceled 30% of flights in preparation for delays and weather-related incidents. We rescheduled to another flight, which was then also promptly canceled. Thanks to technology, we were able to figure out that really it was just Heathrow that was the trouble-maker. The flights out of London City Airport were on-time and running, so we switched our flight there and ended up back on time. Stupid Heathrow! Sooooo ... I now have two tickets to sell on the Heathrow Express train, which runs from Paddington Station to Heathrow, if anyone would like to make me an offer? We paid £68 for these round-trips (this is a sensitive subject, and I don't want to talk about it) and used the first part of them (Heathrow to Paddington), so maybe they're valued around £34 now? 34-ish?L Make me an offer, and I'll pop them in the mail to you. I don't plan on heading back to Heathrow any time soon. Check back later this week ... I'll talk more about adventures in London, including fun with Dodo Birds and the Queen. As usual, I've been having multiple adventures. Some of our best friends came to visit us last week in Edinburgh. Not only did we have a jolly old time in Edinburgh, but our friendsd were kind enough to share their British Airways points with us, flying us down to London for the weekend. More about the adventures when we get back to Edinburgh. If we get back to Edinburgh. We've had a bunch of flights canceled already because of an inch of snow. We are off to another airport that doesn't seem to be quite so afraid. Reasons/holidays to celebrate in the dreary months. I used to dislike January, February, and March. It's cold, it's tax time, and, most importantly, there aren't any good holidays until Derby. St. Patrick's Day isn't really my thing, unless I've got a great gig, and usually the weather is still awful then anyway. The past couple of years, I've spent January immersed in novels, and by the end of the month, I'm looking for a reason to party. So let's look for some less-than-huge-but-still-fun days to celebrate. February 1: St. Brigid's Day! It's all about me, right? Well, if you're not as into me as I am, you can still celebrate the Pagan holiday of Imbolc on February 1st. What would you be celebrating? Fertility and... spring! 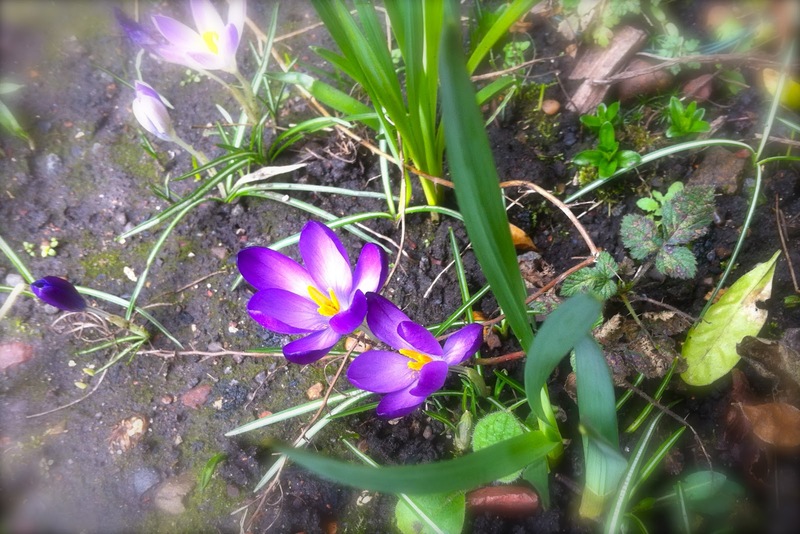 The snowbells and crocuses/croci (both are correct) are blooming, the sun is shining (yes, even in Scotland! ), and we're gaining 4+ minutes of sunlight each day. By this time next week, we'll be up to over nine hours of daylight. I'm feeling perkier by the minute. February 2: Groundhog Day! I don't really care what that groundhog has to say, but I like Bill Murray. February 15: The Ides of February! Because, why not? February 21: Mardi Gras I like hedonistic holidays that involve accordions. February 22: Ash Wednesday OR "Hey, you've got something on your forehead" Day. Okay, so it's not so much a celebration, but a reminder of my heathen upbringing. Also, it's the start of FISH FRY SEASON! February 29: Leap Day! I love Leap Years. Definitely make the most of this extra day by, um, celebrating. March 1: St. David's Day! Just because you aren't married to a David doesn't mean you can't celebrate. Eat a daffodil. Hug your Welsh friend. Put lots of extra F's, L's, W's, and G's in your wwyyrds. Celebrate the Patron Saint of Wales. March 2: Texas Independence Day! As if you needed another reason to host Taco night. March 8: Purim! Mmmmmm... Hamantaschen! I think that pretty much takes us up to St. Patrick's Day. Happy celebrating!